Taiwan Friends of Tibet visited here for a week . 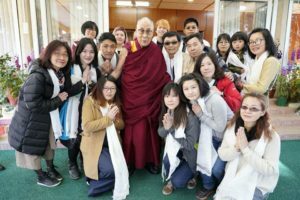 We arrange for them to visit Tibetan NGOs, CTA Information department, Tibetan Parliament, Me-Tse kham (Tibetan traditional medical institution), Tibetan Museum, Library and see the H H the Dalai Lama. We were very happy to arrange for them a week culture and educational tour to learn about Tibet. 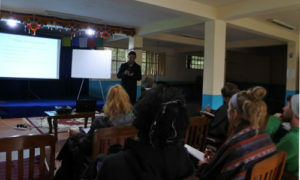 Tibet worlds reopen our education program to embrace registration for both students and volunteers for the adult education for a week, meantime we prepared for students teaching materials and class rooms. Most Welcomed Australia Tibet Supporter group here H. H the Dalai Lama’s second home Dharamsala. They have been supporting more than hundreds Tibetan families, students in pass many years. 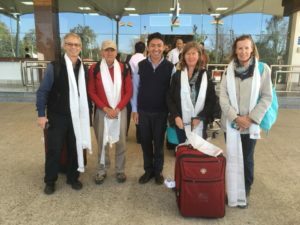 We were very happy to arrange for them a week to visit difference places and hiking. Adult education program start with around 10-15 students and few volunteers in each International language classes. Registration will be open to all and open throughout the year. We started a new class lady talk. 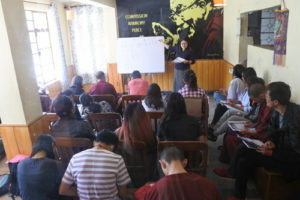 Tibet world organized a special class for those who are interested in English grammar class, from 8:00am to 9:00am. We have Monk Sange sangpo as our English grammar teacher. He will be teaching for almost 8 month. We would like to thank him for volunteering with us. Tibet world reopen our Tibetan cultural folk show of year 2018. We host a Tibetan Cultural Folk Show every Thursday with provide Tibetan’s special snacks like packa, ckasal and Tibetan herbal tea. 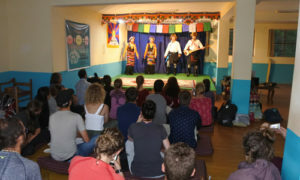 This year we improved our Tibetan Cultural Folk show. We pay more them and also the all artists wear traditional cloths and pay more to the artists.